Although this Chinese company does not sell its phones in the US yet, things will probably change soon and the 5-inch, Qualcomm Snapdragon 801-powered Mi 4 might be its first handset to hit the US market. 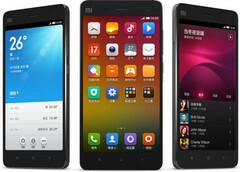 Xiaomi is a big name in China that will soon hit the US market, but nothing is official yet. However, the 5-inch Xiaomi Mi 4 is not the first of their products to reach the US wireless regulatory agency, since Xiaomi Redmi 2 Pro appeared last month at the FCC website as well. This handset has been available in China since mid-2014, but it still can be an interesting mid-range choice for those looking for an affordable yet powerful Android smartphone. Its current price is roughly $255 USD in China, but if it goes on sale in the US, it will probably cost around $200 USD. Since new Xiaomi handsets are expected to show up this Tuesday, we might find out more about the company's plans for the US market as well then, so stay tuned.